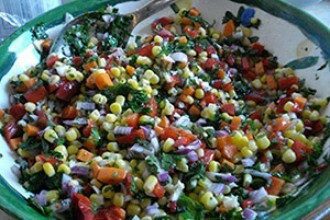 Black Bean & Corn Salad | Haddonfield Farmers Market ~ Celebrating our 13th Season in 2019! In a large bowl, combine the beans, corn, onions, jalapeño chile peppers, tomatoes, avocado, cilantro, basil, lime juice and olive oil. Add sugar and salt and pepper to taste. (The sugar will help balance the acidity from the tomatoes and lime juice.) Chill before serving.